Resistance bands will strengthen and elongate the muscle fibers. They also increase your flexibility tremendously. The new USA SPORTS X-BAND offers an alternative way to train the muscles while on the go and at home. If you want to really add something new to your workout use the X-BANDS with our VTX F.I.D. bench. The bench has built in band hooks that keep rehab, bench work and strength/flexibility routines new and exciting. Contact your sales rep, click the Talk to Troy icon or request a quote today to learn more about the all new USA X-BAND. The new USA SPORTS X-BAND by Troy barbell & Fitness is the perfect accessory for any home gym. The number of exercises you can do with the bands is endless, they are ideal for working on your back, abs, triceps, legs, biceps, chest, and shoulders. USA SPORTS X-BAND takes the place of larger, bulkier equipment, making them easier for the home gym. 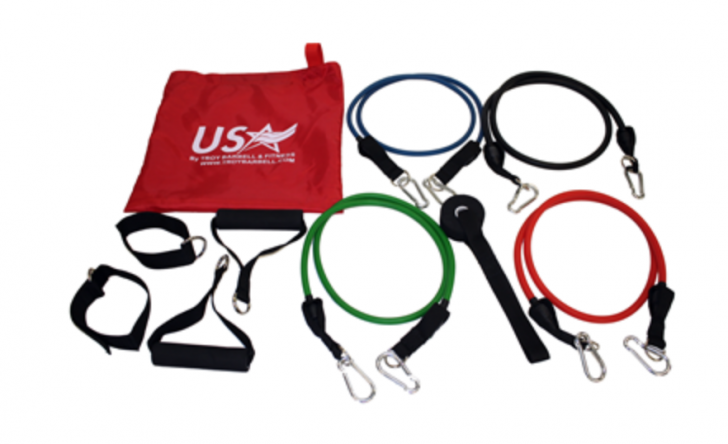 Resistance Bands also have a mechanical advantage in that resistance is maintained through every part of the motion.